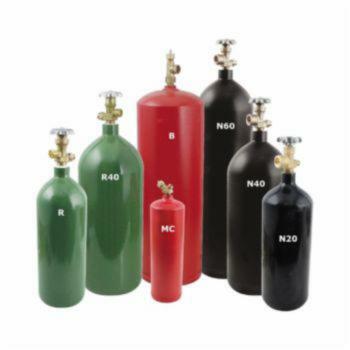 Varies, Industrial Acetylene 40 Cubic Foot Tank, Steel, Acetylene Gas, For Cutting and Welding in Construction Industry Acetylene (C2H2) is a colorless gas used in a variety of industrial applications. Its unique value is due to an ability to achieve the highest temperature (as high as 3200 degrees Celsius) of any fuel gas on combustion with oxygen, releasing more than 1400 BTUs per cubic foot. HVAC technicians use manual torches, either oxy-acetylene or air-acetylene, for brazing. Oxy-acetylene requires a cylinder of compressed acetylene gas as well as a cylinder of compressed high-purity oxygen. These gases combine for an intense flame temperature. An air-acetylene system requires only a single acetylene tank, taking oxygen from the atmosphere. Since air contains only about 21% oxygen, it was difficult for older air/acetylene torches to reach a temperature suitable for brazing, so these torches were used mainly for low-temperature soldering. With the development of swirl combustion technology, air/acetylene systems came into use for brazing. Oxy-acetylene welding is a cost-effective alternative in remote locations that lack reliable electrical supply, and is the only fuel gas that creates a flame hot enough to weld steel. It is also used to apply wires or powder to metals and ceramics, and non-stick coatings to metal castings. It is the first choice of fuel gases, offering low oxygen consumption and safe use within a confined space. In commercial supplies, acetylene exhibits a characteristic odor, often described as garlicky. Some common industrial applications for acetylene include:welding shipbuilding research laboratories glass manufacturing.